I‘ve had many contractors in my own home over the years and it always drives my wife and me crazy when some of them barge in like they own the place, tossing their equipment around and potentially dinging up our walls, doors, floors, etc. We work hard to keep our place tidy and there’s nothing worse than a contractor coming in and making a mess of things. Because it drives us so crazy, we promised ourselves we’d never be “that guy”. In fact, we take protecting our client’s home and belongings very seriously and always treat it as if it were our own. 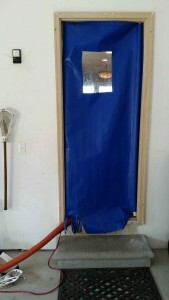 We often receive compliments about the many steps we take to safeguard your belongings, home, and business while we clean, including the use of corner guards which protect your drywall corners, floor mats and tarps to protect your floors, hose barriers to shield our hose knuckles from your floor, and several other extra precautionary steps we take as part of every cleaning we do. But without a doubt we receive the most compliments from the our use of our Seal-A-Door door opening guard. This simple but extremely effective protective device is designed to keep Heat or Air Conditioning inside, and weather, bugs, and critters out while we clean. It does have some size limitations and we’re working with the manufacturer to get more sizes available, but as of this writing (7/22/15) the Seal-A-door fits on over 95% of the doors we’ve used it on. If the Seal-A-Door doesn’t fit, we have a backup “door tent” that we use. It’s not as handy as the Seal-A-Door, but it works in a pinch. The Seal-A-Door is just one of many ways we protect your property and stuff!